This command allows the user to visualize the amounts of accounts with a specific grouping, for a specific period or with a specific subdivision. In order to calculate, obtaine and print reports, choose the Accounting reports command form the Account1 menu. From Banana Accounting 9 it is possible to include a logo in the accounting report printout as well. After obtaining your accounting report , go to File menu -> Print preview command. From the print preview click on the the Setup icon, and in the dialog window that will open, in the Logo option, seleg your logo insted of the none option. You can also check the how to setup a logo page. 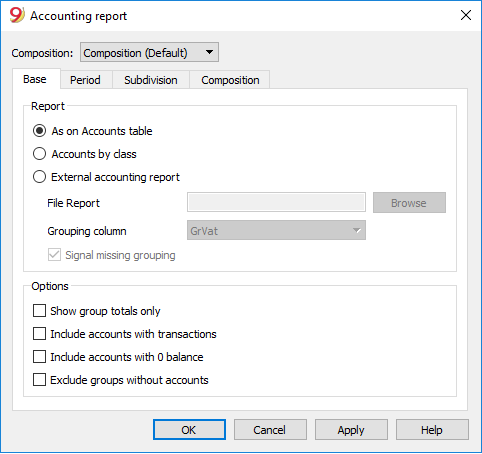 External accounting report - the Report will show the data according to a grouping system preset in a separate file (File menu, New command, Double-entry accounting group, Accounting Report). Exclude groups without accounts - groups that contain only accounts with zero balance will not be printed. A new table is created where the results are shown.